I and my son of eighteen years old built our house in a little village just near Béziers, in south France. We like to build with natural building techniques, we already done most part. We are creative so the house isnot common. We prefer you stay for long period. You will be received in the family . Food include. We are most vegetarian and I try to eat more raw food. Construimos nuestra casa en un pequeño pueblo cerca de Beziers, sur de Francia. 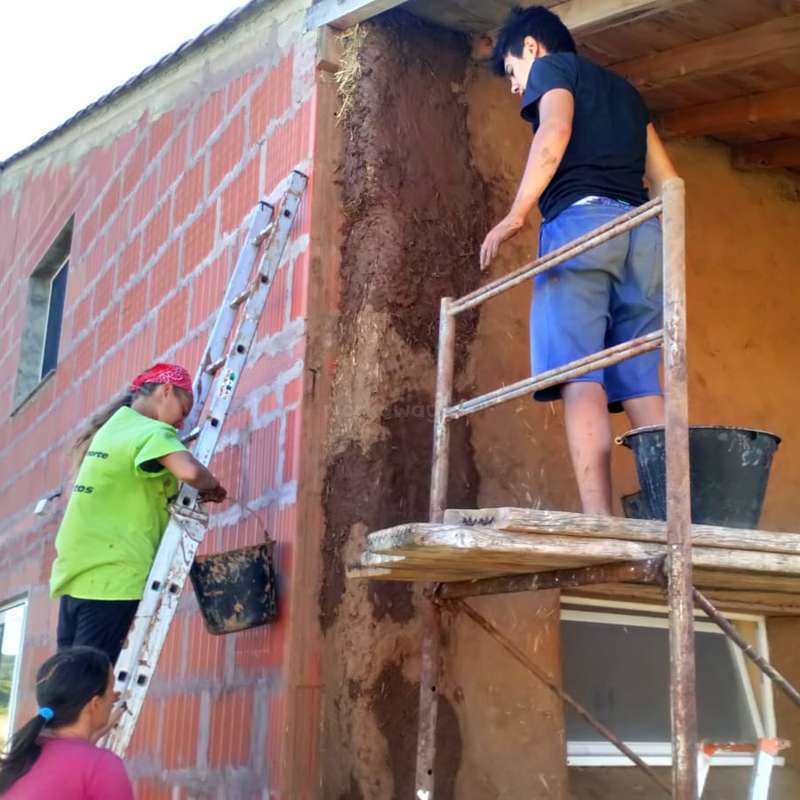 Nos gusta construir con técnicas de construcción naturales, nosotros ya terminamos la primera obra, necesitamos ayuda para hacer los suelos de madera y paredes de adobe, pinturas, un gallinero y el jardin. Acogemos aquellas y aquellos que tienen ganas de descubrir, de capacitarse, de dar una mano con habilidad, de conocer gente...Nos gustaría hacer autonoma la casa en energia y necesitamos la ayuda de las personas que tienen algún conocimiento acerca de la energía, solar, biogás, Si te gusta compartir conocimientos en este campo y experimentar, por favor ponte en contacto con nosotros. Preferimos acogerte para largo termino. Te recibiremos en la familia, Comida incluida. We expect the volunteer to be with us for long term two weeks minimum and help us 5 hours a day. We would like receive some help from people who already have some experience in building or gardening and who are tidy and clean. 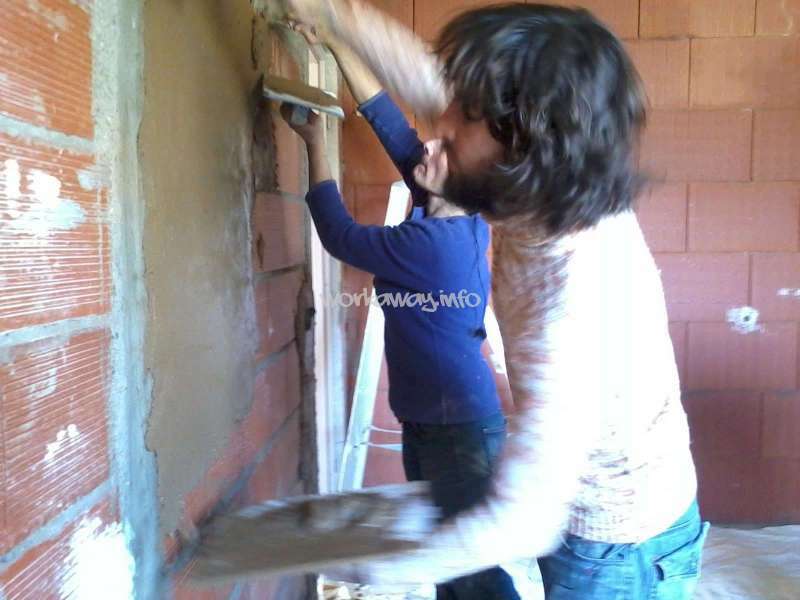 El voluntario se tendría que quedar como mínimo dos semanas y ayudarnos con la obra 5 horas/díarias. Necesitamos ayuda de algunas personas con un minimo de experiencia en construccion o jardin, deseamos que sean limpios y ordenados. You will be received in our family house. In warmer season tents in the garden possible. Food included. Couple welcome. Te recibiremos en nuestra casa de familia. La comida está incluida. Pareja bienvenida. If you like to hike, walk, bike, swim in the river, that is the place. We live in a very nice place in the Natural Park of Haut Languedoc. There is an easy access to Béziers downtown by public transport. Noelia est une belle personne, Une femme volontaire et décidée avec beaucoup de sens de l'humour. Elle aime beaucoup la nature et le jardin, elle a fait un superbe travail au potager et m'a aidée dans les tâches quotidiennes. Grand merci Noelia. Marina est une jeune femme active et volontaire, très souriante. Elle est dynamique, très facile à vivre et très sociable. Ce fut du bonheur de l'avoir à la maison, elle m'a bien aidée. Merci Marina. Thank you so much for everything, I really hope come back in other moment. A bientôt ! Merci pour ta confiance et ton accueil! Ce fut un excellent séjour! Unfortunately i only stayed with Francoise for 10 days, but i will never forget those days. The surrounding area is just beautiful. It's a calm place and it is very picturesque wherever you look. The work was easy and the atmosphere regarding the work was relaxed. The food provided was good, and i really appreciated that Francoise included me in… read more some other activities outside of work. She is a very nice host and genuinely good soul. Je suis restèe dans la maison de Francoise 10 jours. C’était trés jolie. Je ai travaillé dans le jardin, je l’ai aidé à faire un mur et aussi avec le ménange. La règion est très belle et il y a beaucoup des activité à faire, marcher, la velo et aussi nager à la riviere. Quand je suis arrivée je ne parlais pas le… read more français mais elle et aussi son fils sont étés tres gentills et patiencs avec moi et après 10 jours je parle un petit peu de français. Francoise est généreuse et positive et le travaille avec elle est belle! Arsen est trés gentil et sympa et nous amusant beaucoup avec les jeux des cartes! Expérience absolument incroyable! Merci beaucoup!! Samuel stays 2 weeks with us. He lives in his own and knows also share. He is thorough in his work and respectful. He is a charming person who enjoy to share what he has. I learnt a lot from him, have a good ride and a blue sky. Francois is such a positive person. She is always nice and funny, so you have always someone who cheers you up. The food she cooked was very good. She also shared the kitchen with me, so I felt like at home. I had everything I needed, even more. I helped her and a other workawayer with some woodwork and paint. There is… read more still a lot to do, so if you have the chance to help her, do it. She gives you everything back if you want. I hope you succeed in future with your plans. Thanks for all from Italy. Merci beaucoup Françoise pour une expérience très marveilleuse :) J'ai appris beaucoup sur la culture française: la langue, la nourriture, les voies de la contruction et comme manger comme une person française aussi! J'ai aimé votre hospitalité et j'espère te voir bientôt! Mélanie est une jeune femme très active, dynamique, enthousiaste. Elle est menuisière et fait un travail d'une grande qualité, elle aime le bois et travailler le bois. Elle est très bonne cuisinière et de très bonne compagnie. Je te souhaite de très belles rencontres sur ta route. Merci Mélanie de tout mon coeur pour ta belle présence. J'éspère bien que vous pouvez profiter de la terrasse que nous avons fait! I had a very enjoyable and relaxing two weeks staying with Françoise near Béziers. The region is beautiful and full of nice hiking and biking spots. I really enjoyed the cultural, culinary, and language exchange with Françoise and the other workaway that I worked with. Françoise was also great with helping me improve my French! Thanks again! One month with Françoise and her family in February it was too fast. Harmony is a main what we feeling in this house. Job and rest, time together and our time, trips to cities and walking around village- everything was very nice. Françoise is amazing woman! We happy to meet you, Arsen and Bernar! Ow, details:) Room with window on roof- we saw… read more stars. Delicious French food and cheeeeese. A lot of space for Nicole incide and outside, toys. A lot of tools for Sasha- it is really paradise for handyman. What an amazing guy. Roland repaired almost everything in the house. He listed and stored all tools and equipment. He did a great job to install the woodstove and the tubes in the chimney. Thanks to Roland the house has become a more pleasant, warm and welcoming place. He helped me a lot personally to find a method to carry out my projects. I… read more really appreciated his involvement in our family. I put into practice every day what he taught me. I wish he crosses the road of beautiful people. You are welcome anytime. Estuve dos semanas en casa de Francoise, con mi amiga, y fue una excelente experiencia. Francoise es increible, muy amorosa, preocupada por todo, y su hijo Arsen muy simpatico. 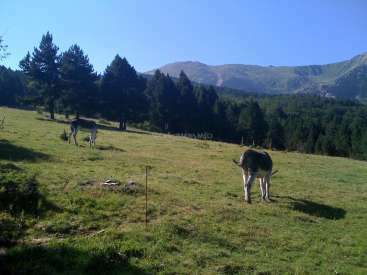 Es un lugar muy relajado, agradable, para pasar un tiempo lejos de la alocada ciudad, y poder admirar y apreciar la naturaleza que nos rodea. 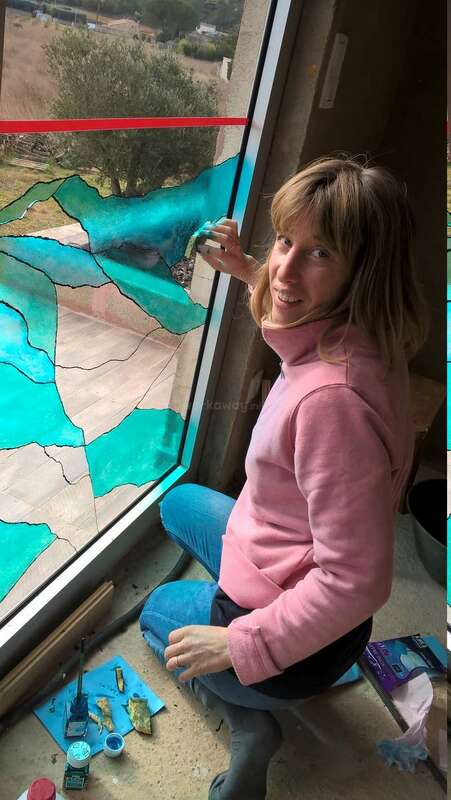 Muchas gracias por todo… read more Francoise, disfrutamos mucho el tiempo que pasamos en tu casa. It was my first workaway with a not so good experience. I stayed 2 days at françoise's house and after sitting for talking about the activities we both decided that I should leave. I've asked about activities by an email before and arriving there the only activity for the moment was cleaning. 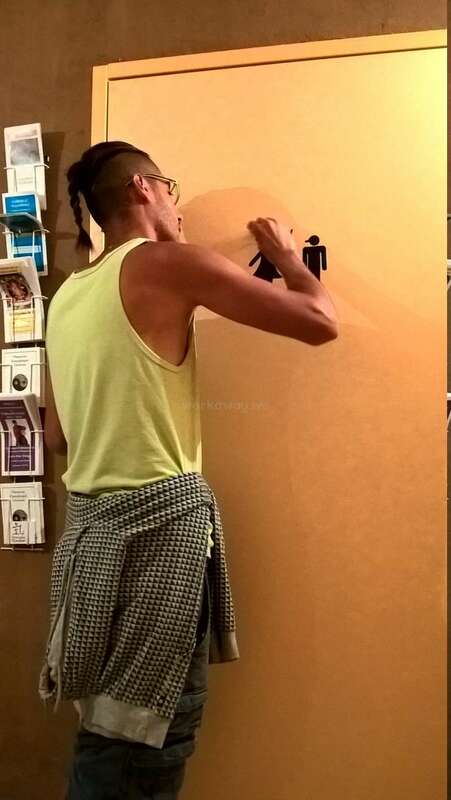 The floor, the bathroom, the glasses. I really don't… read more mind about cleaning, but if you say before that you have activities like "organizing a garaje, build a wood floor and work in a 'permaculture garden'" to do and you dont do what you've said, it's not nice. And actually, permaculture is not the best way to put in the profile. If you want to see something related to it, its not the right place. Françoise is a nice woman, but i think the profile can be better described and when somebody ask for the activities she can be more honest, avoiding lost of time. Hope you find other volunteers that can help you on what you need. All the best, Françoise! Christina is a fresh, dynamic, interesting, enthusiastic, lovely young woman. I really enjoyed her company and she helped me a lot with all the task I give to her. I wish her happy encounters on her way and I hope we will meet again soon and make a japanese bridge together in the garden. Our first workaway experience! Everything was more than perfect. Francoises is a very nice host. We spent a lot of time together. We were working, cooking, swimming, laughing, dancing, ...... Her son is also very nice and her family. My kids enjoyed a lot too. We would like to come back and spend another holiday with Francoises and Arsene. Estuvimos una semana en casa de Françoise, pasó muy rápido el tiempo y lamentamos no poder compartir más con ella y su hijo. Ellos son personas muy relajadas, nos hicieron sentir libres en su casa, pudimos prepararnos nuestras comidas como nosotros quisiéramos. El trabajo fue sencillo y ella es muy flexible con los horarios y permite que uno mismo… read more pueda organizarse. Le agrademos mucho por llevarnos a algunos lugares cercanos donde necesitábamos ir. Cerca de su casa hay un agradable río donde ir a nadar. Francoise and her son Arsen were very nice hosts. Despite Francoise is a very busy woman she took us for a great trip to the mountains and picked us up from the nearby city after we were gone for the weekend. We stayed in a private room in her house which is not finished yet but comfortable enough. 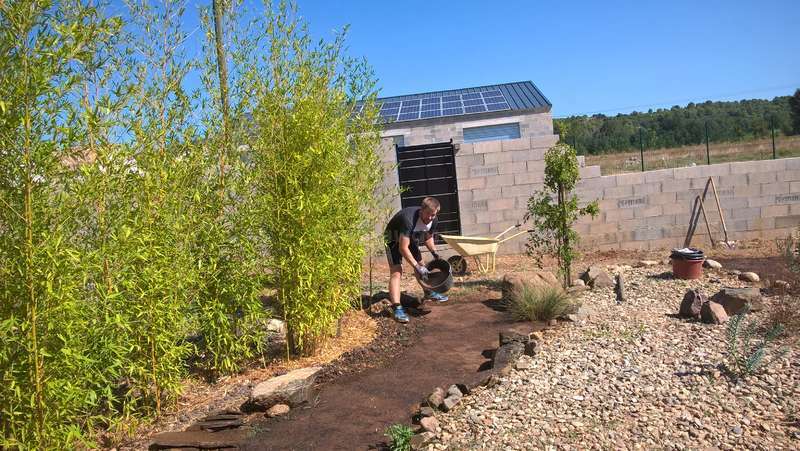 Work was quite easy,weeding,planting,making a… read more mosquitiere. Recommended for people interested in alternative medicine and permaculture gardening. Annika est une personne très agréable, sérieuse. Très bonne cuisinière, merci pour les nombreux plats que tu as préparé. Elle vous apprendra à sauter à la corde, elle a une super technique, Elle est de très bonne compagnie et elle est très consciencieuse dans le travail qu'on lui donne à faire, ce furent deux semaines très agréable en sa… read more compagnie. Merci Annika d'avoir apporté ta gentillesse et ton enthousiasme dans la maison. Mon amie Evélia et moi, on passait deux semaines chez Françoise environ fin de mars. Elle est une personne très sympa, heureuse et créative. J’aime très bien son mode de vie minimaliste, sa maison bioclimatique et le jardin qui est énorme ! On se sentait immédiatement comme part de la petite famille, participait aux excursions et aux courses,… read more jouait avec son fils et le lapin où conversait avec la grand-mère en espagnol. Ils habitent à Cessenon sur l’orb, un village très calme situé dans un paysage très joli avec beaucoup des collines et la rivière. Nos idées étaient toujours bienvenues, n’importe pas si référé au projet où dans la cuisine. Ensemble, on découvrait le monde des orties, pratiquait mon français et dansait au concert au village. Françoise est très curieuse et essaye tout ! Elle rit beaucoup, ce qui est contagieux, elle aime la musique et l’atmosphère à sa maison est toujours très aimable. Merci pour l’instance chez toi et toutes les expériences. Je te souhaite le mieux pour tous tes projets et beaucoup de gens de Workaway gentils comme toi ! En la vida todo esperfecto. Todo llega y uno llega en el momento y lugar adecuado!!! Compartir con Françoise y su hijo en su casa fue maravillosamente expectacular, es una gran mujer con mucha sabiduria y conocimiento. Una gran amiga y una gran madre y persona. Buena maestra de frances!!!! Definitivamente me voy con muchas ganas de volver y seguir… read more aportando en su proyecto y en su vida!!!!!! Aprendi tanto que estoy muy agradecido y feliz!!!!!! In life, everything is perfect. Everything arrives and one arrives at the right time and place! Sharing with Françoise and her son at home was wonderfully expectacular, she is a great woman with a lot of wisdom and knowledge. A great friend and a great mother and person. Good teacher of French !!!! I definitely go with a lot of desire to go back and continue to contribute in your project and in your life !!!!!! I learned so much that I am very grateful and happy !!!!!! Evelia est une jeune femme dynamique, volontaire, active et responsable. Elle a apporté dans la maison renouveau et douceur. Indépendante, autonome, intuitive et sachant partager, c'est une jeune femme pleine de ressources qui vous surprendra agréablement. Mon grand ado de fils a été conquis. Deux merveilleuses semaines passées en compagnie de Françoise et Arsène, dans un petit coin de paradis au bord de l'Orb. Les mots ne peuvent décrirent la gentillesse, la simplicité et l'accueil chaleureux dont nous avons bénéficié pendant ce séjour. Françoise, tu es merveilleuse, toujours le sourire, et ce rire que je n'oublierais pas de sitôt,… read more résonne encore à mes oreilles pour me rappeler la simplicité et le bonheur que peuvent aporter chaque moment de l'existence. Nos conversations, nos silences, les infusions de romarin et la cure d'ortie, tous ces souvenirs resteront à jamais graver en moi, et je ne saurais remercier par des mots tout ce que tu as pu m'apporter en deux semaines. Ta maison apporte un mélange de paix et de sérenité, et je suis la plus heureuse des workaways d'avoir pu y avoir accès! J'epère vous revoir tous les deux, en attendant que le projet continue dans la joie et la prospérité! It's was a great experience! 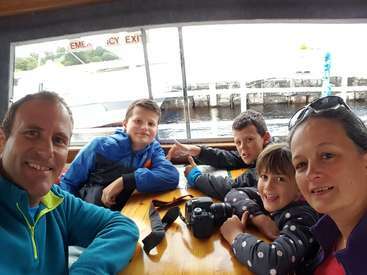 I spend more than one week with them in february, the family is very friendly although the language was a barrier for me i enjoy the conversations, works and have a fun too! you have your own privacity in a department with private room, bath and kitchen share with other worksaways, but the meals we are all together… read more and it´s was very good and always so tasty!! the work was so light maybe because of Winter …? i don't know.... Me and another lovely couple of workaways made a shelves / cubes for Arsen room and paint it, we collect wood …. Francoise it always worried about me, if I understands or if I am good, so pleasant! 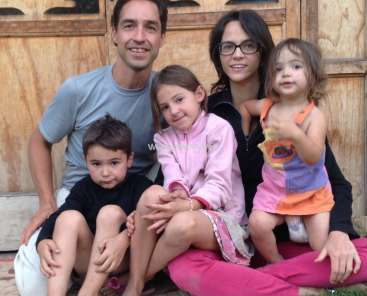 We spent 2 weeks in February with Françoise and her family, together with another workawayer. We had a small apartment for ourselves, which was great but a bit cold (2 electric ovens to share between 3 rooms). We ate with the family, it was always plentiful, tasty and in good company. 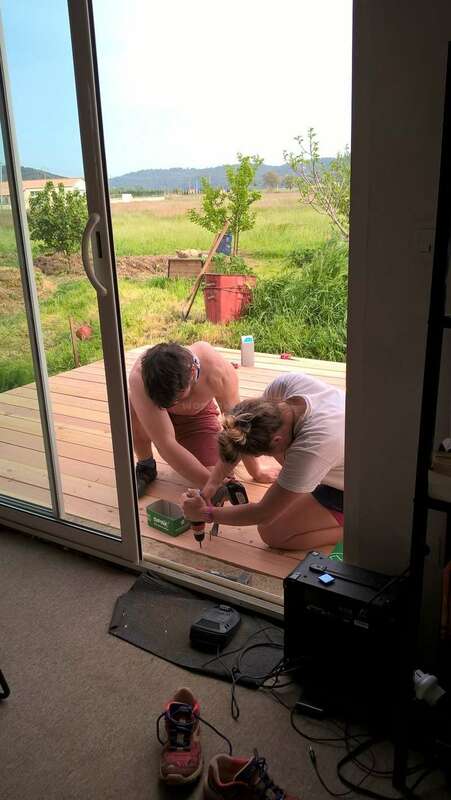 Our work consisted mainly in finishing her son's room,… read more sanding/painting the wooden staircase, constructing some small woodshelves and painting the windowframe. As we were interested in learning about eco-construction, we were a bit disappointed, and the lack of organisation of the work might slow down the process a bit. But, we are sure, in the end the result will be amazing. Thank you so much Francoise for allowing me to spend some time with you and your family. I can say that my French improved a lot while I was here as I was able to speak french with Bernard and Arsene during dinner time as well as enjoy Bernards cooking. And Bernards home made wine was awesome. The work was well balanced with the time of leisure. I… read more went to Marseille for a few days. I enjoyed cycling in the mountains although perhaps Bernard and Francoise would call them hills.... I disagree! I met another lovely workaway also so we were able to practice French together. 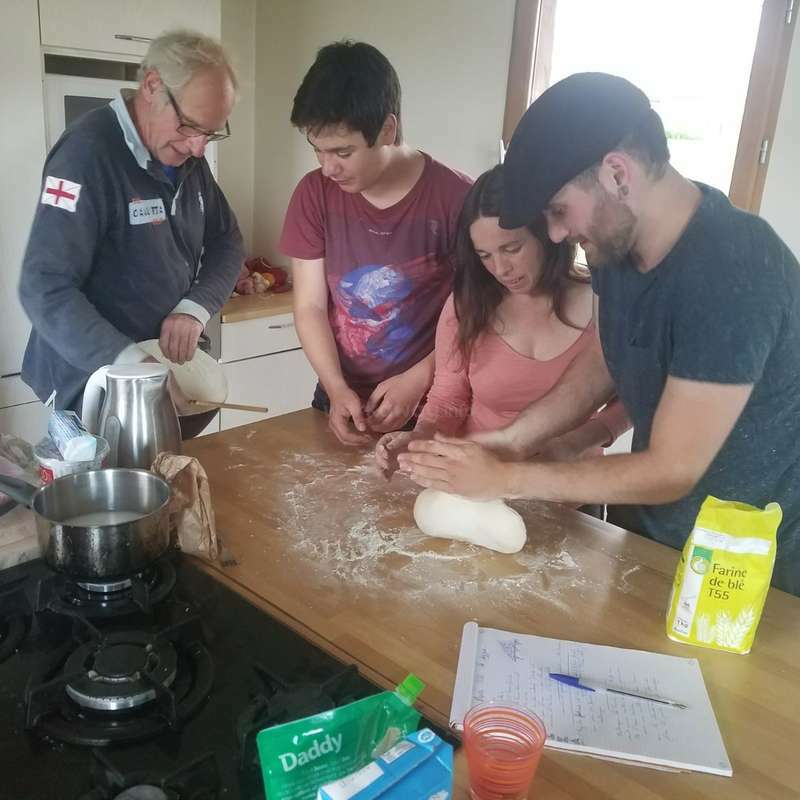 There is a lot of opportunity to spend time with the family to learn about French culture as well as on your own if you wish. 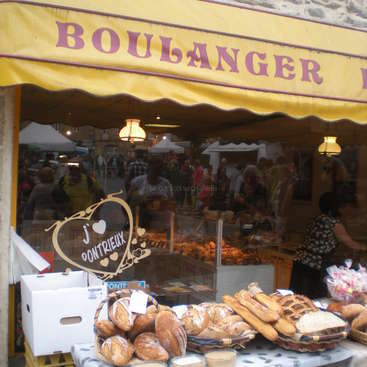 The area is beautiful with the chance to go to Bezier if you want a change of scenery. Thank you for this opportunity. My experience with Françoise was great! We got along very well and she was very nice to me, worried that I was well fed and helped me improve my french. In the house we took nice tea breaks, she gave me options for work outside under the sun when possible and we had lovely food. Bernard was also very nice to me, even if we couldn't understand… read more each other all the time, we tried and it was funny! The rest of the family was also very nice, their son Arsen, Bernard's daughter, Françoise brother and parents, even the bunny. Thank you for everything! I stayed in Françoise's house for two weeks and I am very happy to have done that. I think I made to fit in very well in this family. Françoise was always worried about me so I didn't need anything ever. The job wasn't hard at all, actually very easy to handle and also we didn't have a strict schedule. Besides, the food was quite tasty, thank you… read more also to Bernard for it :). About the place you are gonna stay in is comfortable, you have your own privacy. Thank you very much guys, I hope you keep enjoying building on your new life. Edward is a person with a lot of knwledge in ecologic construction, very good advises, interesting conversations. I learn a lot about transparency. I wish you nice encounters. Prèsque pas mal!! I will remember these words for the rest of my life. 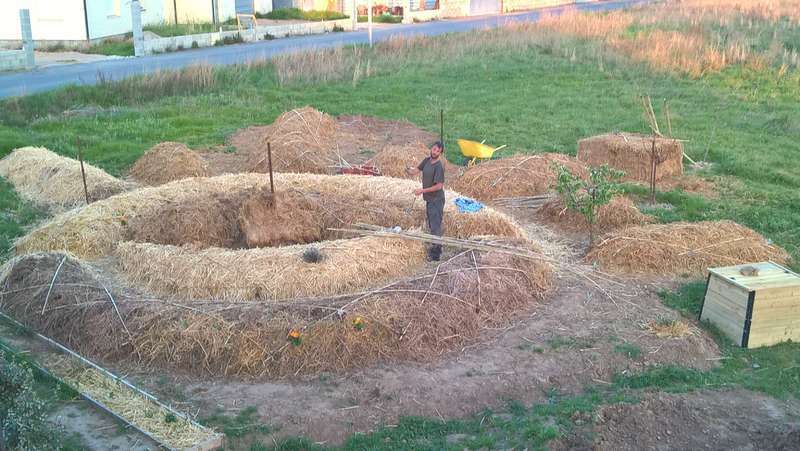 It was nice to have you as host and work together building the strawbale wall. There was much joy throughout the day. You are wonderful hosts. Francoise, thank you for your non-stop concern for my well being. Bernard, merci à toi pour les conversations joyeux et claires.… read more Arsène, les crèpes étaient une surprise et très bien à manger; bonne chance dans ton lycée. Francoise, Bernard and Arsene are good hosts!! I have spend 10 days in Berlou. Very beautiful and quiet area, perfect for hikes and bicycle rides. Francoise is always worry that everything is good with the volunteers. I think that before our arriving, this host place was great. We should have stayed in the house, where her family lives. This was the place, where all the volunteers stayed. Unfortunately Francoise had an argue with her husband and we paid for it. We slept in the house she wanted to renovate so we didn't have hot water and almost no… read more electricity. We slept on a mattress in a dust. It also wasn't save at all, because house didn't have doors. We understood her situation, but until she fix her life, it's not a good place for volunteering. Bryan stayed with us six weeks, he layed all the tiles in the bathroom, he made us an amazing shower. He is a serious, caring, smiling, easy-going man. Thank you for everything, it was an amazing time in your company and a very nice sharing. We hope you find good hosts on your way. Paco is a wonderful sensitive man, full of humor, light and deep. He offers us more than a help, a different point of view. We hope to see you again soon. You are in our heart. I cannot explain with words my experience with this family...So I'm not going to try to do it. I'm only going to say I'm sure with them you are goind to feel and to the learn the real meaning of workaway. Françoise, Bernard and Arsene are one the best people I have ever meet in my life. And know I consider them friends. Si puediese poner mas de 4 cáritas! !! Mi primer workaway y no pudo haber sido mejor. Le doy gracias a la vida de poder tener la suerte de conocer a esta familia. Son una familia hermosa Francoise, Bernard y Arsen. Bernard es muy amable, atento y es un excelente cosinero! ! En mi vida no habia comido nunca cosas tan ricas!. Aprendi mucho de… read more él. Arsen es una chico buenisimo con mucha mucha energia jaja y juega muy bien al ping pong. Francoise es una persona muy dulce, muy amable siempre atenta a que estes bien. El trabajo es sencillo y dan ganas de trabajar aun mas para compensar lo bien q ellos se tratan. Realmente los voy a extrañar a los tres y espero algun dia poder volver.!!! What a great first workaway experience. I stayed here for two weeks and couldn't have had a better time. The family really made me feel welcome and was a great environment to relax in after a days work. Best of luck with the rest of the construction. What can I say about my time in Berlou, say that was a great great experience is really far of reality, even say that was wonderfull is still far far. I felt like my home from the begining, I have awesome connection with this wonderfull family. 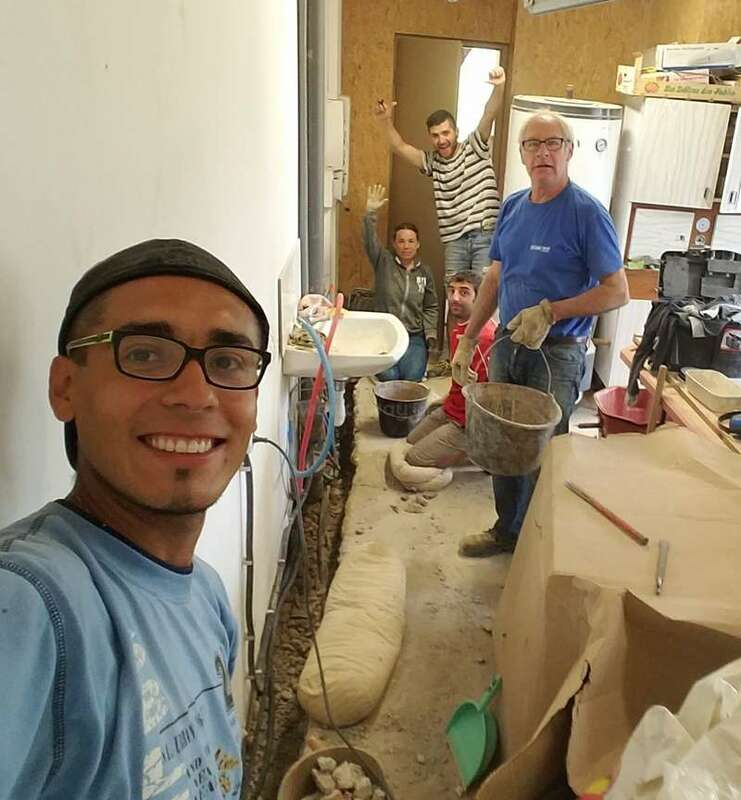 Bernard: A huge hardworker, I learned many things about wine farming thanks to him; and he always get… read more solutions for every tool who breaks, awesome. Arsene: A great young guy, well connected with all the workwayers and the happyness of the house. Francoise: During my 2 weeks there I felt the care who she takes about all of us. Confident, mother, genuine and always smiling. You´ll learn many things about her. Thanks for everything that we share, thanks for the awesome food and wine. Be happy family Escobar, I miss you a lot!!! This was my first workaway experience and it couldn't have been better. The area of Berlou is beautiful wine country, the rooms are large and you have all the space you need with your own kitchen and bathroom. The work was clearly explained and the hours were always fair. But the best part of this experience was getting to know the family and the… read more other workaway-ers there. The food was delicious and there was always enough even though we were sometimes 7 at the table. I found Françoise and Bernard constantly helpful with suggestions for places to go, learning french, and just having good conversation. I can't recommend it highly enough, I felt part of the family here and would love to return someday. Really a great experience! Françoise and her family are really good people! have taught me so much and gave me so much! the method of work is very professional, serious and nice! The house where I lived was very welcoming and we ate a lot and a great time! Una sola palabra sería suficiente, MERCI !! Recomendable 100%, se aprende mucho en todos los sentidos. Que os vaya muy bien en todo y espero volver pronto. Christina and Reda are extremely nice, friendly and helped us a lot. We enjoyed a lot the smile and willingness to Christina and the friendliness and competence of Reda. We hope you have many wonderful encounters. You will be always welcome. We stayed for 11-ish days at our first workaway and it was incredible! Francoise and Bernard are extremely kind, patient, understanding, generous, and accommodating in all things, especially regarding unexpected changes in plans (travel, length of stay, etc.). 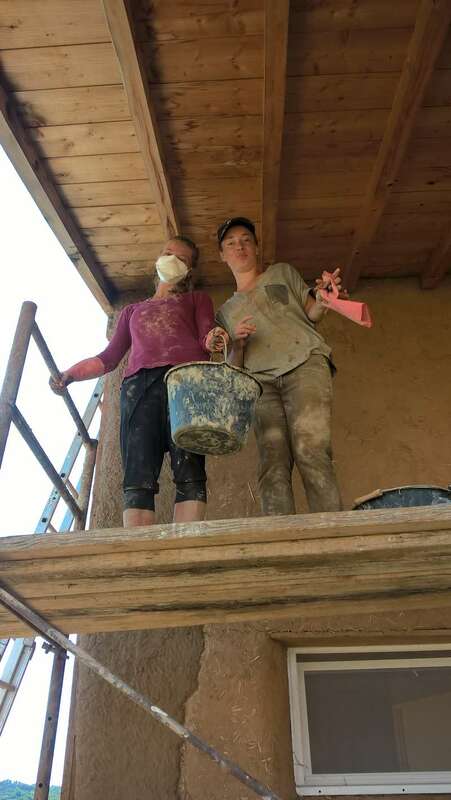 We worked hard and laughed a lot; the whole family is very animated and inclusive!… read more Together as a team, we were able to make some serious progress on the green roof above the kitchen, and the strong manly men installed windows, doors, and (almost) the first toilet. Don't know how you've lasted this long without it! (; I don't think either of us has ever eaten so well at any point in life, and we only wish we could have contributed more to this family and their home. We truly do hope to return in the future for this project or another one! Thank you for everything! All the best, Christina & Reda. I was there only 4 days but it was nice to discover the amazing south of france, full of vineyards and lovely towns. I could enjoy the nature and your amazing food and wine. Thank you for all François and Bernard! Wonderful place and amazing people! 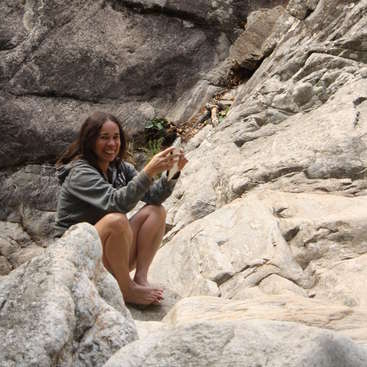 This was my first workaway experience and I truly enjoyed it! 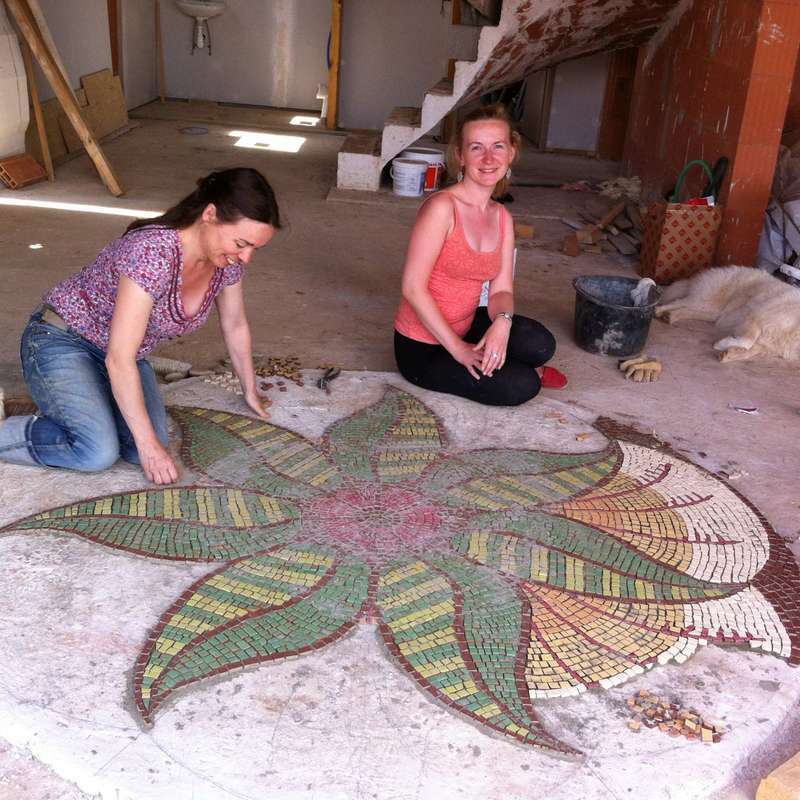 I stayed longer than planned because I enjoyed your company, and that you let me do this mosaic for your new house. I hope it will last forever and you will enjoy looking at it every day;) Hope to see it when the house is finished. All the best, Thank… read more you! The week passed quickly with you guys. You are a fantastic team. Thanks for your help and your enthousiasm. Hope to see you again, you are really welcome for the paintings. Our first workaway experience! Everything was perfect. Francoise and Bernard are as kind and generous a hosts as it is possible to be. First time working with natural building too, finally! Great experience, can't wait to try some more techniques. Je n'ai pas de mots pour décrire le temps passé avec votre famille. Merci beaucoup pour tout! Je ne vous oublierai jamais! À Valencia vous avez une amie pour toute la vie. Merci Luna de nous avoir fait partager ta facilité d'être, ta joie de vivre et ta créativité débordante. Nous sommes un peu plus vivants grâce à toi et la maison pétille et vibre par ses beaux murs de terre-paille, beau travail. Merci Nerys pour ton passage chez nous. Tu nous a beaucoup apporté, ta joie, ta bonne humeur, ton énergie, ton fort caractère et ta belle personnalité. Merci pour tout. Les murs terre-paille sont très beaux, tu as fait du bon travail, la maison a beaucoup de chance de t'avoir accueilli. house. We have good fun. We are very happy to have receive you, Kasia and Asha. You work very hard and be good compagnie for us. We appreciate very much your smile and your reserve and discretion. Have a nice travel. I really enjoyed my time with Francoise, Bernard and Arsene. They're very nice people and they were good hosts. Also they live in a beautiful area. Thanks Francoise and Bernard. Let me know how the project goes in future. Thanks very much Alex, we appreciate a lot that you came to help us. We appreciate your kindness, your serious, your presence and your smile. Merci beaucoup. We are very happy to know you. It was wonderful to work with you and share our lifes. We appreciated your enthusiasm and your good mood. The house will be great one day thanks to you. Volunteer at a micro brewery in the French Pyrenees.